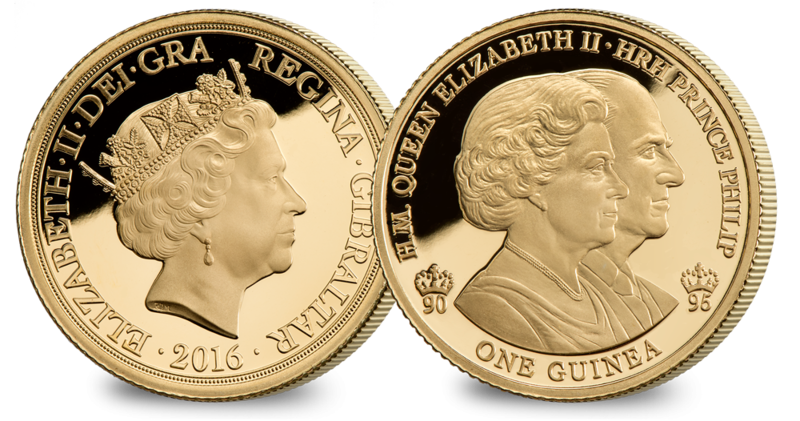 The Queen’s 90th & Prince Philip’s 95th birthdays commemorated on one historic coin. 2016 has been a truly historic year for the Royal Family. After Her Majesty The Queen celebrated her 90th birthday, the first ever British monarch to reach such a landmark, her husband of almost 69 years, His Royal Highness Prince Philip, turned 95. Minted to mark this historic occasion, this beautiful Guinea coin, struck in proof condition, is a unique ‘One Year Type’. The reverse design features Maklouf’s new conjoined portrait of the Queen and Prince Philip, which fittingly takes its inspiration from the William and Mary ‘double portrait’ Guinea of the late 17th Century. A ‘90’ and ‘95’ mint mark topped by crowns is positioned either side of the portrait.